Have you ever seen a grown man cry? It’s not by way of an emotional response to the first peek of our first ever baby rabbits, however cute they might be, but rather something to do with what might be the World’s hottest chilli. I went round to see friends Jim and Rita on Saturday—principally to use some of Jim’s woodworking tools—when, passing through the kitchen, I saw a plate of bright red chillies. I asked what they were for, so Rita explained and then said I was welcome to take a few home with me. I took three of each type, planning to use some for cooking and save an example of each for their seeds. (We’ve already bought several varieties from the The Real Seed Catalogue for planting up next year in our new polytunnel). That evening, it was my turn to cook and so I turned to an Italian cookbook, choosing a dish called spaghetti con gamberetti e rucola (spaghetti with prawns and rocket). Said dish called for one chilli. I chose the smallest one (the little ba***rd pictured) and removed the seeds but I didn’t taste it to check for heat, a significant omission. In an Indian dish, one might reasonably expect to encounter a bit of spicy heat but in an Italian recipe the chilli was there just to give the flavours a lift. Unwittingly, I was cooking fusion-style and created possibly the first ever Indo-Italian “spaghetti vindaloo”. We were tired and hungry so we had to eat it, Gabrielle adding yoghurt and me bravely carrying on without external cooling aids. I apologised profusely and, at the end, did an incredibly stupid thing. Weary, I pushed my fingertips deep into my eyes to give them a good rub—with the same fingers I’d prepared the chilli with—and then realised, microseconds later, that I had severely injured myself and needed airlifting to hospital at the very least. I ran to the bathroom with my face on fire and only felt anywhere near comfortable with my face under cold running water. Gabrielle turned instantly, not to the First Aid box, but to Google, searching under “antidote chilli in the eye” through which she found out that adding lemon juice or vinegar to the water is helpful (and it was). Neither of us can understand why anyone would want to cultivate a chilli so hot, so we won’t be saving seeds to plant. Aged 46, I have finally learnt that one should always check the strength of the chillies one is using ... heed this advice! Back to the bunnies, unfortunately, our excitement is tempered by the news that myxomatosis, a viral disease spread by mosquitoes and fleas, is in the area and has done for most of our neighbour Annick's rabbits. A couple of really cold nights last week might hopefully have reduced the insect population and we shall investigate getting her vaccinated, either immediately or when the young are independent of her. Have a look at Wikipedia’s entry for myxi and this link to learn more. Thanks for the antidote! 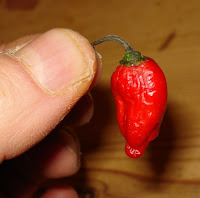 That picture of a chilli looks suspiciously like a freocious on I grew last year.......its just as well you removed the seeds as they make it even hotter!! On the topic of myxomatosis, I had an experience with a rabbit dreadfully afflicted by the disease. I was a townie lad of just 19 years with my then country living girlfriend when we discovered the animal. With no hint of concern or sentimentality she told me that I had to kill it. Kill it! I had never killed anything in my life before apart from swatting a few flies. So when I talk of her lack of concern or sentimentality, I am talking for myself. But, determined not to let the Borough of Richmond and Twickenham down, I gave the animal a tentative rabbit chop. The thing screamed like a scalded baby. My heart almost seized. I had thought rabbits were mute and was utterly appalled that my cackhandiness had added to its suffering. I am sure all you country folk will be sniggering into your glasses of cider or whatever else you have for breakfast, but it taught me to leave killing to natural born killers. 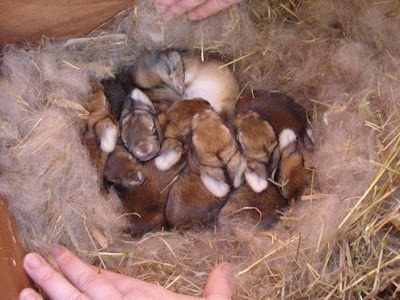 There is a lot of mxy around at the moment but you can get your bunnies vaccinated may be a good idea to enquire about VHD ( viral haemorhagic disease vaccine at the same time) inexpensive to vaccinate for mxy and it does save lives. So...never having heard of this I have to say that is interesting. Especially what wikpedia said about the "accidental" release of the disease into France. Of course the man who released it blamed others instead of taking responsibility for it! As if he couldn't have known that spread of it could occur. Hah! Good luck with your bunnies. Will you only breed during the winter and early spring so you won't have to worry about the babies getting it now that you know of it?